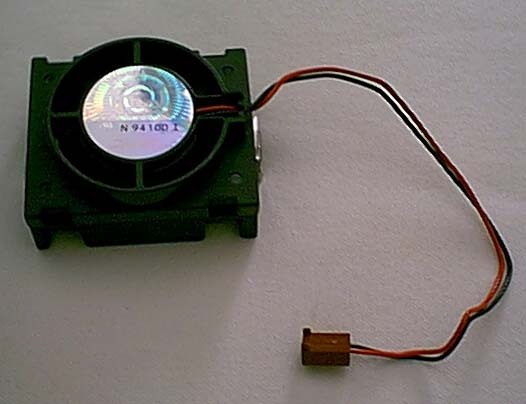 Page 1 - Have a Celeron Heat Sink/Fan Laying around? Put it to use! First off, there is that clip which is in the way. I didn't want the clip banging around against my motherboard and I'm not sure it would have even fit in there with it on. So, I took it off. 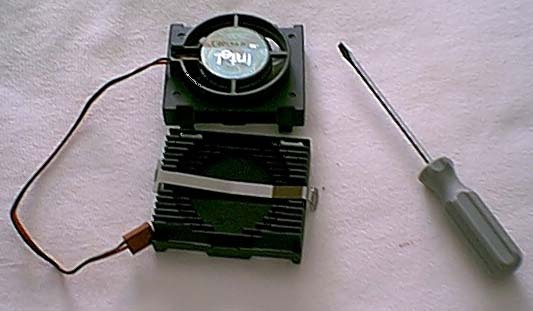 In order to take out the clip you need to remove the fan on top the heatsink. Start by pulling the clips out. 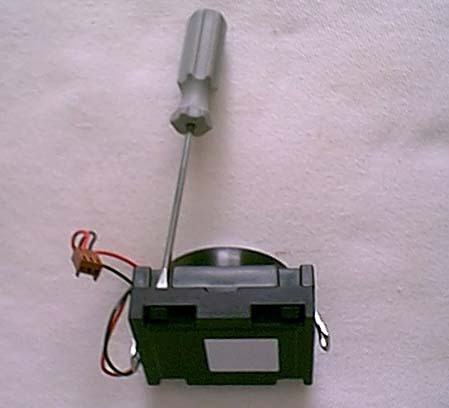 You stick a small flat head screw driver (or similar item) down into where it is clipped on (see below) and twist. It will pop out quite easily. Repeat this to the other clip and pull her off. Now that you have the thing open take out that clip. You can bend it, throw it, or save it in case you ever need to put it back together again, which is what I did. Now we need to get rid of that sticky pad on the bottom. It's not near the strength you need to keep it on to the chipset. 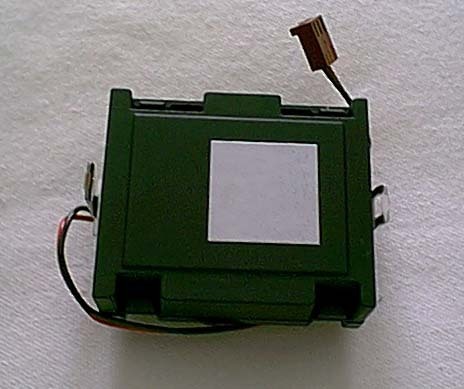 The pad is designed to work with the clips in place. Here's where you'll need some frag tape or I prefer the 3M thermal tape from 2CoolTek. First peel the old crap off, slowly. The slower you do it, the less crap that will be left on there for you to rub off. Now apply enough tape to cover the entire surface area of the CPU slug. Now comes the annoying part. If you're like me you already have your computer assembled. That means you'll need to pull out your motherboard so you can remove the clips from the back of the heat sink that is already on there. Once you get your motherboard out, you just need to squeeze the the little pins holding it on and it should pop off very easily. Don't put your motherboard back in after you're done. The next part is easier if you leave the mainboard out and set it on a cardboard box. 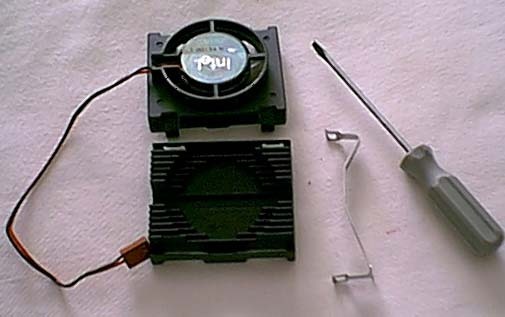 Be careful, remember you can fry out your motherboard easily with static.